A financial statement form is created to keep the track of all the financial data of any individual, business organization or any other entity. Every business organization needs to keep the proper track of all the transaction, revenues, profits and losses. All the financial information need to be presented in a decent and organized manner in order to make the information easy to understand. This is when a financial statement form comes into action. These forms are as important as a legal document as these are the only authentic evidence of the transactions. 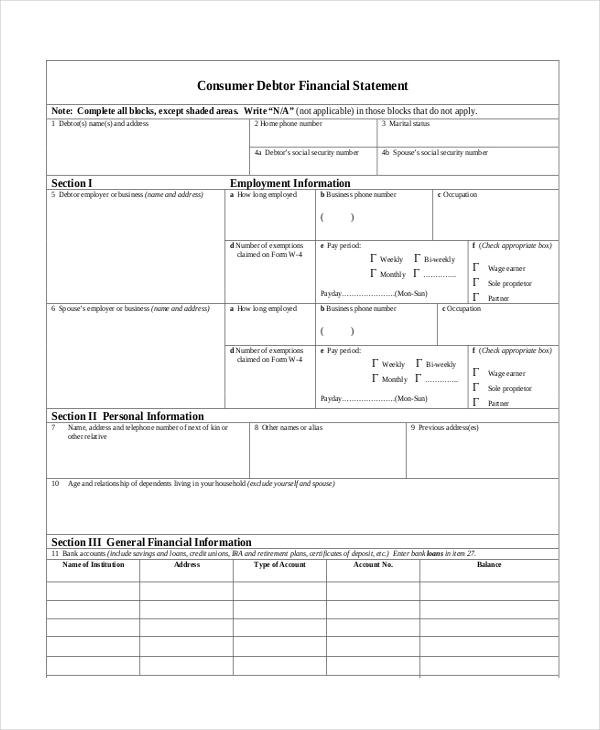 In the U.S, the personal financial statement form is mainly used by the small business administrations. This form needs to be completed in order to help the general partners, proprietors and the managing members of the limited company, the owner, the person serving as the guarantor of the loan so that all of them can understand the current financial position and act accordingly. 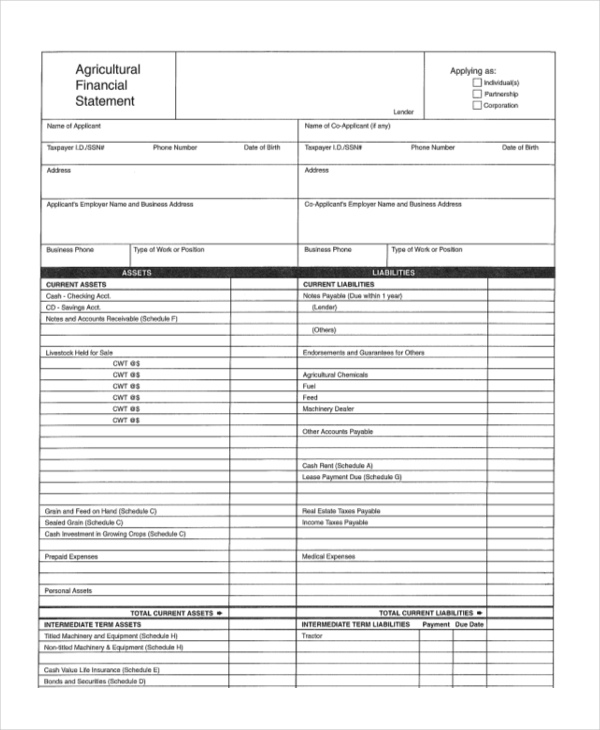 A personal financial statement form contains information like the name of the concerned person, the address, the business phone number, the home phone number, all the information of the assets and the liabilities and so on. One should read the form very well before filling out and submitting it. A personal financial form needs to be submitted to the lender who is processing the application or the certified company or the agent who is generating the application for surety bond guarantee. 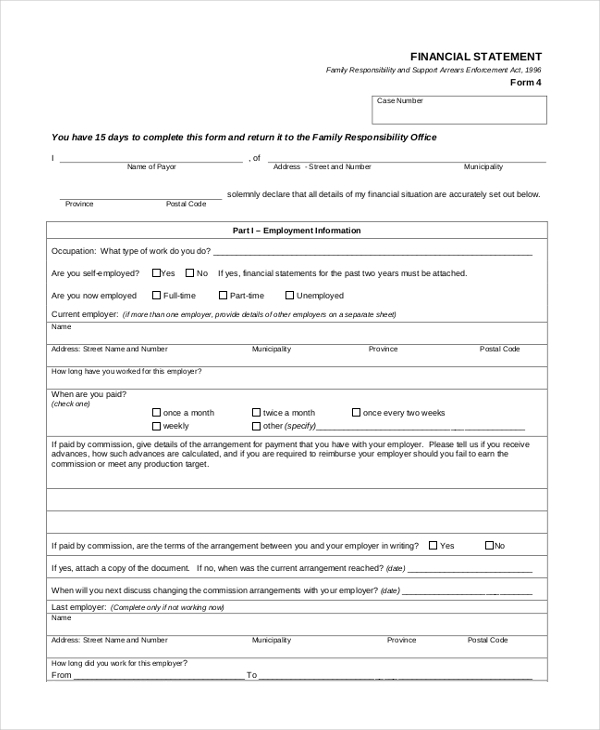 One needs to fill out this form and submit it to the family responsibility office within 15 days. The form contains the name of the payer, his/her address and other required information. The first part of the form is known to involve all the personal information of the employer including the kind of job he/she is doing, the name of the company, the address of the company, the payment details and many more. The second part of the form includes the income details of the employee. The employee has to provide details about his/her source of income and the deductions such as provident fund tax, medical insurance and so on. 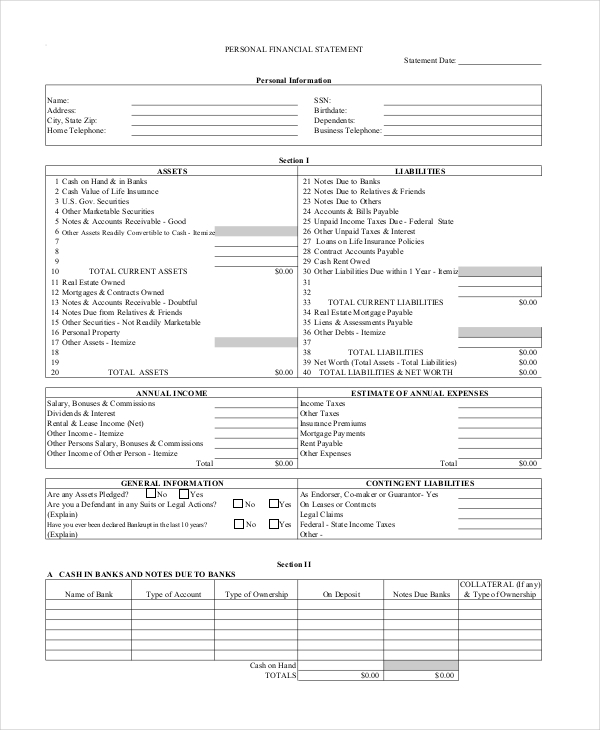 The third part of the form contains information about the regular expenses of the employee. Small business financial statement form is regarded to be the financial statement of a debtor. This form consists of the fields such as the name of the employee, the SBA loan number, the birth details and the contact number. Other than that, the form also includes the details about the monthly income of the employee and the name and details of the spouse. Apart from that, the form also includes details about assets and liabilities of the particular employee. The financial statement form for divorce comes into action at the time of filing for divorce. The form includes the details of the concerned court, the number of the case, and the names of both the parties fighting for the case, their addresses, telephone numbers, email id and other personal information. Apart from that, the form also includes the details of their children (if any). The form also includes the monthly expenses of the dependant partner, the school expenses of the children, medical expenses and other essential expenses. The employed partner has to provide the details of his income. The form also includes the details of the assets and liabilities of both the couple. 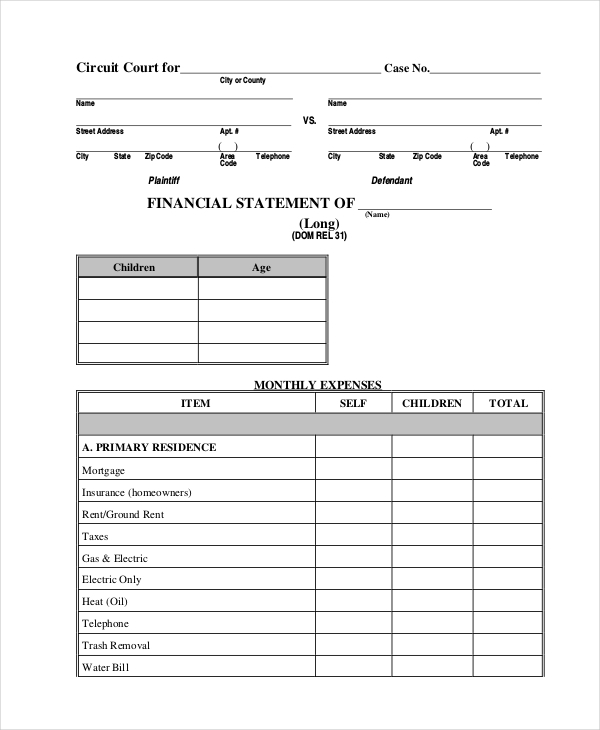 Personal financial statement form is meant for recoding the financial details of an individual. First of all, the form includes the essential details such as the name of the individual, the birth details, the contact details and address. Apart from the personal details, the form includes the details about the assets and liabilities of the individual. It also conveys about the annual income of the individual, a basic estimate of his/her annual expenses, the bank details and information about all the medical and life insurance. 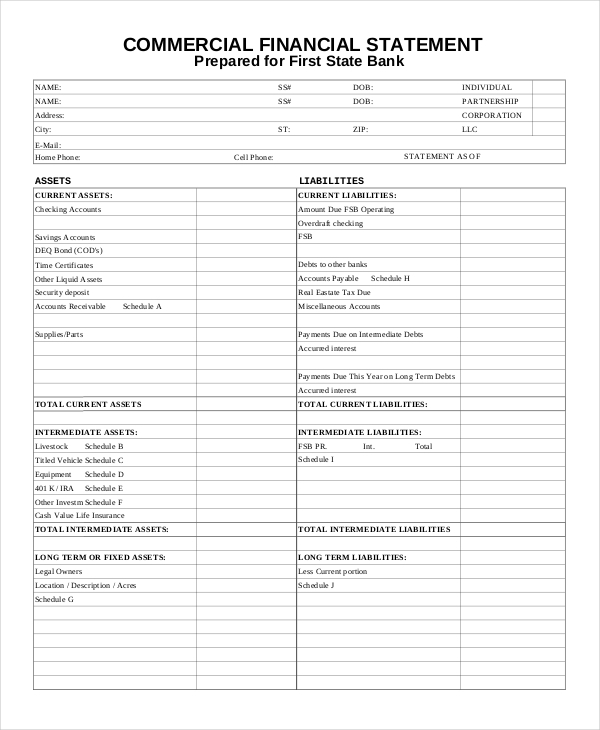 Agricultural financial statement form includes the personal details of the applicant such as his/her name, mail address, birth details, address, and pin code and contact details. The form not only includes the details of the applicant but also the details of the co applicant. 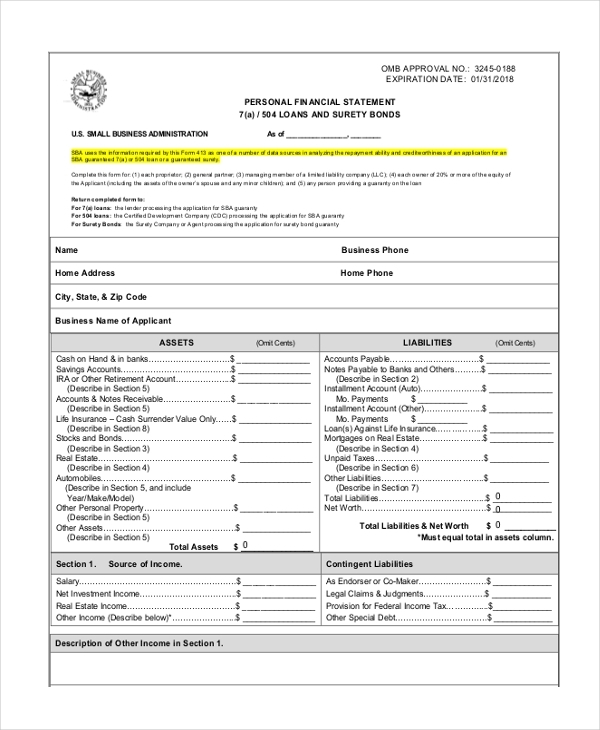 Other than that, the form also includes the details of the liabilities and assets of all the applicants. If any of the applicant has owned or rented any real estate entity he/she also needs to include the details of this property in this form. If the applicant has any livestock, he/she also needs to submit all the details through this form. The name of the form says it all. Army financial statement form is utilized to enlist all the financial details of an army. 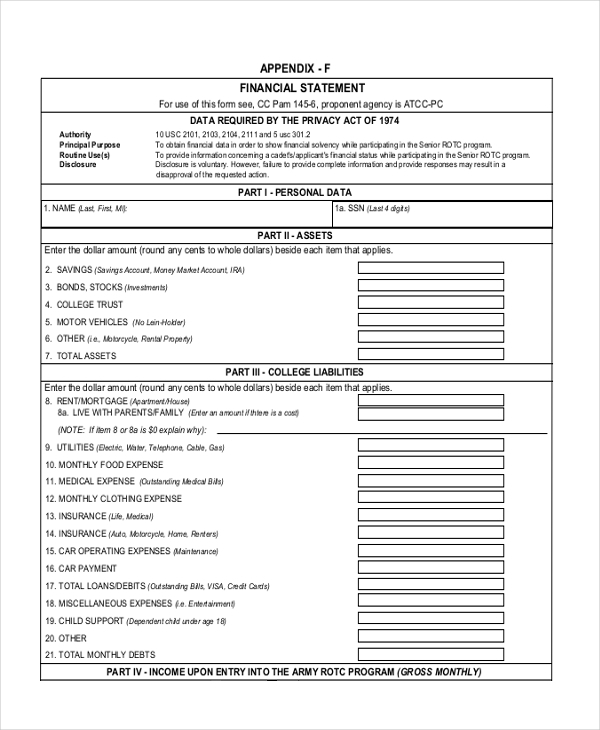 Apart from personal data, the form includes the information of all his savings, stocks, bonds, motor vehicles, college trusts and other assets. In short, the form needs to include the detailed information of his total stock. Commercial financial statement form is mainly prepared for banks. This form contains the name of the applicant, the birth details, address, contact details, email id and other personal details. In addition to that, the form also contains the information of all the current assets, all the, liabilities, stocks and bonds of the applicant. If the applicant has borrowed funds to anyone, he/she needs to include the details in the form. If the applicant is involved with any legal suits, he/she needs to explain the matter in details in the form. The applicant needs to read the form well before submitting it. He/she needs to fill out all the fields of the form before submitting it. Consumer debtor financial statement is used to convey all the information of a particular employee. Apart from the personal information, the applicant also needs to include every details of his/ her employment. 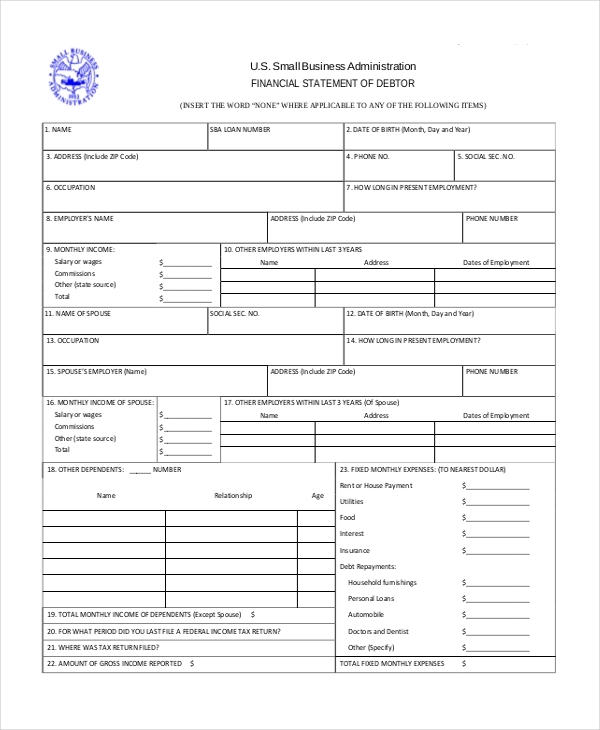 Additionally, the applicant also needs to include his/her general financial information in this form. The applicant has to provide all information about his financial condition. What is The Importance of The Financial Statement Analysis? Financial statement analysis questionnaires are really beneficial for several reasons. These forms help all the shareholders a lot because it becomes easy for them to keep the track of all the records and updates of the company’s shares. Often, the shareholders have to take certain decisions whether they need to carry on with the shares of the company or sell those out. The financial analysis helps the shareholders to initiate such decisions. Such forms also help to initiate all the plans regarding the business and the dealings. The management of the company has to formulate policies and plans for the future growth of the business. Financial statement forms help the management to understand the current position of the business. Both the individuals and the business entities often make certain investment decisions in order to take their financial gains to the next level. During the time of taking investment decisions, the financial analysis helps them a lot. Apart from all these, the providers of the loan and the creditors also need to take help of the business analysis details. They often need to decide whether they have to demand for highest interest rates and extent the loans or not. In these crucial moments, the financial statement forms help them to obtain all the information related to the financial conditions of the company. What are The Objectives of Such Financial Analysis? Financial statement forms help to make the assessment of the previous performances of a particular business organization or any individual. The past records play an important role when it comes to take the company to the next level of success. You can weigh the past records well to understand what have you achieved, what more to achieve, what do you need to do in order to fulfill the targets, what steps worked well to get the best outcomes, all these analysis are very important to understand the growth of a company and all these can be figured out by supervising the financial statement forms. The days of searching the format of the required forms and documents in the market are gone. These forms are easily available on our website. You can easily download and even modify these forms.